The Carpet Museum of Iran is located on northwest of Laleh Park in Tehran Iran, and only 7-8 minutes walking distance to Contemporary Art Museum. Laleh Park and the carpet museum is one of the most popular places to visit in Tehran. A handmade carpet means many things to Persian families and other regions. It's a display of wealth, an investment, a family heirloom, and a source of energy - full of spiritual and cultural spirit. So it's no surprise the Tehran Carpet Museum is a symbol of the entire regions traditions and culture. Once you arrive the Carpet Museum building itself, you'll find it has beautiful architecture with a facade resembling a carpet-weaving loom. There are many photo opportunities, however flash photography is not allowed inside. The Carpet Museum of Iran was designed by Queen Farah Diba to mix ‘70s style with carpet-inspired function, and the exterior loom functions to cool down the main building by casting shadows on its walls. If you compare Iran weaving styles, you'll find the city carpets have more of a modern commercial nature, in contrast to village which haven't changed much over the centuries. Remarkably this is because Iran's nomadic and tribal rugs were unaffected by the commercial trends, but also because they make for great gifts and souvenirs for locals and foreigners alike. The carpet trends greatly reflect weavers lifestyle also, this evolved a fascinating story into the history of Persian Carpets. 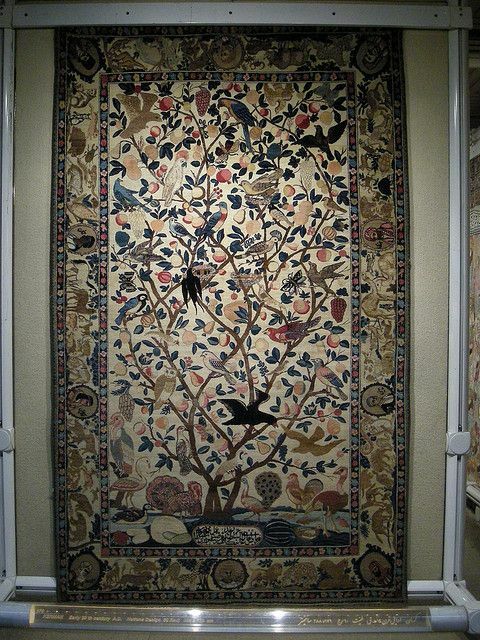 The Carpet Museum upper floor often hosts temporary carpet exhibitions, such as kilims and regional displays. Between the two floors, Tehran's carpet museum houses more than 150 pieces dating from the 17th century to the present day. These regional displays found in Iran are stunning, plus there are a few unique carpets such as the "Tree of Life" with "Kings and Notables". These are just some of the most famous places to visit in Tehran. But perhaps the real voyage of discovery consists not in seeking new landscapes, but in having new eyes. For public transportation you can use the Tehran metro lines 3 (green) and 4 (blue) to reach Enqelab square. The normal hours are 9 a.m. to 5 p.m. every day of the year except Mondays and Religious Holidays. The exhibition gallery and library are closed on Mondays. • 25000 Rials for foreign tourists. • 2500 Rials for Iranian adults. • Free admission for members of Association of the Friends of Cultural Heritage and ICOM with ID cards. • Gift Store is located on the First Level (Cultural Heritage Foundation Store). • Information Desks are located on the First Level entrance. • Smoking is not permitted in any area of the Museum. • Telephones are located on First Floor. • Visitor Services Information is located at the First Floor. • Video and still photography are permitted throughout the permanent collections of the Museum and Research Institute using existing light only. No photography of any kind is permitted in the Rugs gallery. No commercial photography is permitted. No camera stands are permitted. • Tea House is located on first level. What do you think of Tehran's Carpet Museum? Leave your comments below.